Valencia, in Spain, already experiences hot and dry summers, a problem likely to be made worse by climate change. For the city administration, tackling this threat is a key priority. GrowGreen is investing in nature-based solutions in the Valencian neighbourhood of Benicalap to improve quality of life, reduce pollution and tackle heat stress. Citizens of Benicalap will have the opportunity to share their opinions on creating a greener and more sustainable neighbourhood as part of GrowGreen’s participatory process launched last week. The planned nature-based solutions include improving connections between the traditional vegetable gardens that surround the city and other green spaces, expanding Benicalap Park, and installing a vertical garden. Citizens are encouraged to participate in their design and help to put them into practice. Ultimately, the challenge is to scale up these solutions to other parts of the neighbourhood and across the city as a whole. 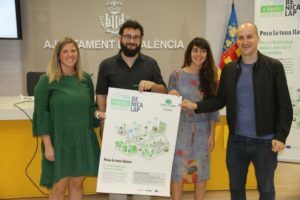 Berto Jaramillo, Councillor for Innovation of the City of Valencia, said ‘GrowGreen provides important support and is a powerful investment both economically and in terms of collaboration with other cities, which allows us to learn from each other’.